"2011 Seçimleri," by Hulki Cevizoğlu, at FEASS, C-Block Auditorium, 12 p.m. Organized by Atatürkçü Düşünce Topluluğu. "İnternette Gökbilim Kaynakları," by Prof. Ethem Derman, at Mithat Çoruh Auditorium, 12:30 p.m. Organized by Astronomi Topluluğu. "Staj," by a laywer from Ankara Barosu, at EE-01, 12:30 p.m. Organized by Genç Hukukçular Kulübü. "Av Turizmi," by Günhan Aktan, at STHM, RC-202, at 12:40 p.m. Organized by Genç Liderler Kulübü. "Gitar Kliniği," by Cem Köksal, at Mithat Çoruh Auditorium, 5:30 p.m. Organized by Müzik Kulübü. "Gitar Kliniği," by Mesut Uğurel, at Mithat Çoruh Auditorium, 7:30 p.m. 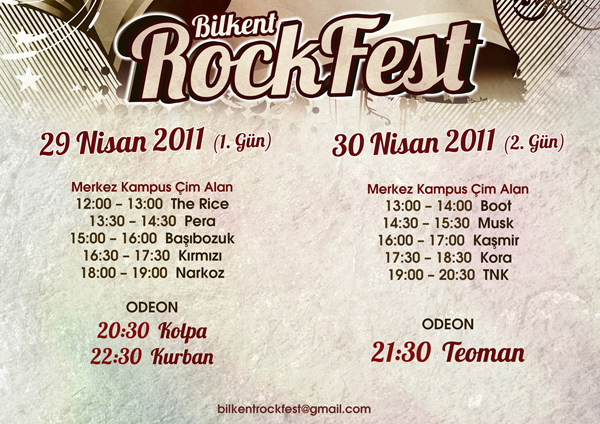 Organized by Müzik Kulübü. "Korean Traditional Music," by Sejong Korece Institute, at the Library Art Gallery, 8:50 p.m. Organized by Doğu Asya Topluluğu. Yaşar Guitar Quartet, at the Library Art Gallery, 12:40 p.m. Organized by Klasik Gitar Topluluğu. Bahar Türker, at the Library Art Gallery, at 12:40 p.m. Organized by Klasik Gitar Topluluğu. Flamenko, by Ahmet Kalır, at the Library Art Gallery, 6 p.m. Organized by Klasik Gitar Topluluğu. Film Night: Star Wars, at FADA, FFB-22, 9 p.m.-7 a.m. Organized by Astronomi Topluluğu. Dance Show from Grease, in front of the Faculty of Science Building, 12 p.m. Organized by Müzikal Topluluğu. "Social Networks, Institutions, and the Process of Globalization," by Fernando Vega-Redonto (European University Institute), at FEASS, A-228, 3:40 p.m. Organized by ECON. The Second Turkish Culture and Lifestyle Festival, organized by the Bilkent University Student Council and Genç Girişimciler Kulübü will be held at Main Campus for two days, April 27 and 28.